The following write up is the extract from the speech of Mahadharmavarman Dr. Yogindrasinh Joshi's Aniruddha Poornima speech where he has clearly described the origin and importance of TRIVIKRAM. Trivikram is Anirruddha Himself, the Omkar, the Paramshiv, the Mahavishnu. 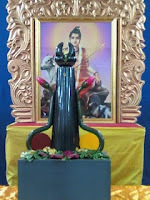 It is the Gun Pratik (symbol) of Lord Harihar. Tri means three and Vikram means victory or to win over. Trivikram wins the entire universe in just three steps. Trivikram further means One who accomplishes various victories. Aniruddha bears the form of Trivikram. Lord Parmatma as Aniruddha has taken form of TRIVIKRAM to throw open His NavAnkurAishwaryas (Nine Forms of divine virtues) to His children i.e. Shraddhavans. Why does Aniruddha have to take this form? It is because we as humans have been steadily blocking His way of entering our lives because of various Pradnya Aparadhs (breach of guidelines of Satya, Prem and Anand laid down by Lord Parmeshwar i.e. Lord Dattaguru). So to widen this road, Aniruddha has to take this form. Trivikram is the support for all the Shraddhavans. It enhances the principle of 'Paavitrya Hech Praman' (Purity is the only Reference). Trivikram kills evil, propagates and enhances the righteousness and establishes Maryada. Trivikram makes life beautiful and mannered. Trivikram is Prem-agni i.e. pure form of love. One can worhship TRIVIKRAM however he wants with pure bhaav. Trivikram has a grey base called Dharmasan. Dharmasan represents purity. Above it there are two pink flowers of lotus supported by strings. These flowers have 9 petals.The right string represents Pingala Nadi (central cerebral cord) in the human body which stands for Sun and His warmth and also represents river Yamuna. This cord also represents love of Goddess Mahishasurmardini. The left string represents the Ida Nadi which stands for the moon and his calmness and also represents Goddess (river) Ganga or Ganges. (Both these cerebral cords originate from Cerebellum i.e. the lower part of the brain and end at the coccygeal area i.e. the bottom-most part of spinal cord. This cord also represents love of Goddess Anasuya. There is also the third cord which stays invisible called Sushumna Nadi which represents love of Goddess Gayatri. Enclosed between these strings of lotuses is the black colored, pole-shaped structure called Vajradand. Vajradand represents love. This is the support of the Universe, support of all the Shraddhavans. Above this Vajradand is placed another flower of lotus called Vajrakamal which again has 9 petals. This Navdal Kamal represents Goddess Jagdamba who is completely filled with divine brightness. The 9 petals represent Navvidha Nirdhar (9 fundamentals) and 9 Saman Nishthas (Equal Considerations) of all the Shraddhavans as given by P. P. Bapu in Shreemad Purushartha Grantharaj. Between these strings of lotuses and the Vajradand but immediately above the Dharmasan there are two circular discs. Right one of Blood Red color and left with Turmeric Yellow color which represent Sun and Moon respectively. Sun represents Truth, it represents Jathar-agni (energy in stomach) in the human body and Moon represents happiness, it represents Dyanan-agni (zeal to learn). The three colors found in TRIVIKRAM i.e. Red, Yellow and Black represent Kumkum, Turmeric and Abir or bukka which are considered extremely pure elements. What is the Need of TRIVIKRAM ? Lord Paramshiv's symbol is Pindi, likewise Aniruddha is symbolically represented by this TRIVIKRAM. Any divine idol of Lord always needs periodic charging but TRIVIKRAM is the charge in itself. There is no need to do its Pratishthapana or establish it. He is self established. TRIVIKRAM endows upon us pure bhav and also increases it. One who worships this TRIVIKRAM with love gets automatically connected to it. Through this TRIVIKRAM Aniruddha demands our under-developed lotus and endows us with His fully developed lotus. TRIVIKRAM would end the worshippers' punishments i.e. his dush-prarabhda. TRIVIKRAM is the gini (divine power) who grants all your righteous wishes at the earliest. Finally as a delight for everyone P. P. Bapu said that this TRIVIKRAM would be soon available to everyone to be worshipped at their homes in form of replicas, as lockets to be wore in neck, etc. But worshipping this TRIVIKRAM in its original form is the best. TRIVIKRAM would be worshipped on every Thursday at Hari Guru Gram in between the Marathi and Hindi discourse given by Bapu. The worship would be called Sukhasavarni. That was lovely compilation of such a important information. Right from what is Trivikram to what is the need of Trivikram & most importantly how to worship it. We know it but we tend to forget the important aspects. It is really a good way to revieve our thoughts & our kowledge.